And yet, another two weeks have gone by without an update. So sorry, blog family! But at least there is a lot to tell! First, I have been asked several time to post a video of Tehilla, so you can all get a glimpse of her personality. That is much more difficult than it sounds, as she is quite a spunky person, but refuses to allow me to record her. The other day, she insisted on bringing an umbrella to school, despite there not being any rain and burst into a funny version of "Rain Rain Go Away" that she made up on the spot. By the time that I reached for my phone and started recording, it was over and she refused to do it again. 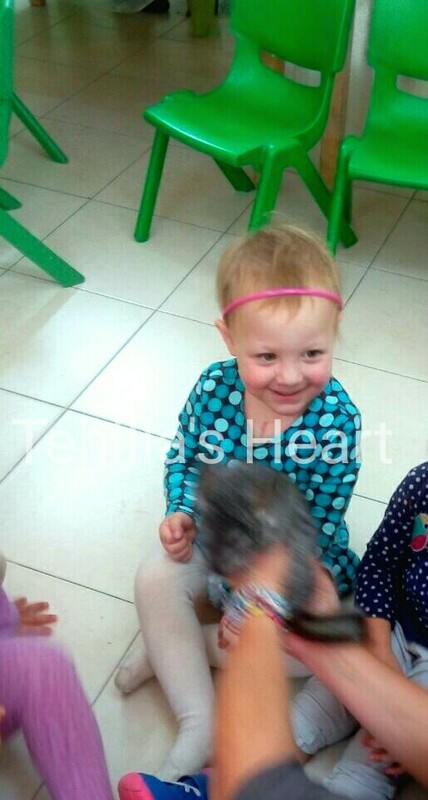 Tehilla had a (very belated) birthday party at school. 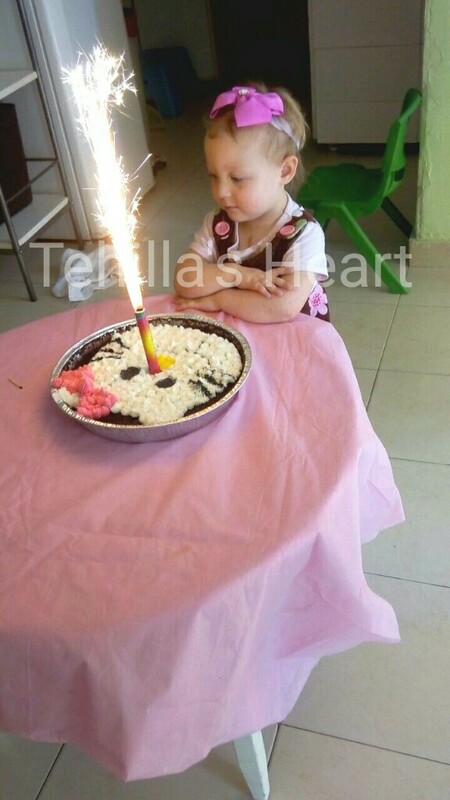 I made her another Hello Kitty cake and she had a blast with her friends. She came home shrieking the birthday songs the rest of the afternoon, but clearly enjoyed herself. Her teacher sent me over 30 pictures, but I can't share them, because they have other children in them. Here are two, so that you can get a glimpse. 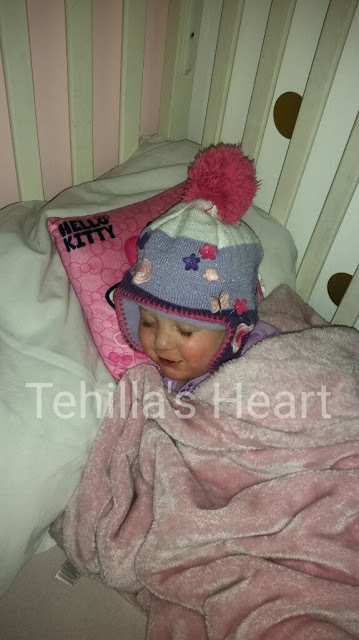 Her teacher and I have had some very nice conversations about how much Tehilla has come along and how she has had a surge of maturity, development, ability and especially, energy. They see her participating more in the activities and asserting herself better. It's an amazing thing to be having these conversations and knowing that this little heart warrior has come so far. And, here she is being the spunky, funny little toddler that she is, demanding to go to sleep with a winter hat on. Some vaporub on her feet and amazingly enough- she is fine. You all might be reading this and rolling your eyes, but I'm not sure you realize what an absolute miracle this is for her. We are blessed beyond measure each and every day to have calmness and new levels of stability. I have some other big news to share, but I will make a separate blog post a little later. 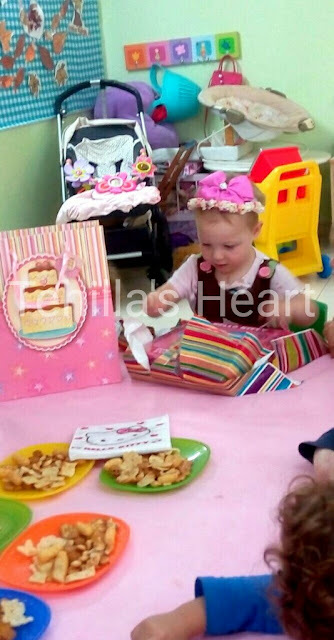 Thank you for the video, it does "my" heart good to see this princess with a heart. So much wonderful news - and that video is totally full of wisdom, isn't it? "... not a person, not yet." Love you guys!